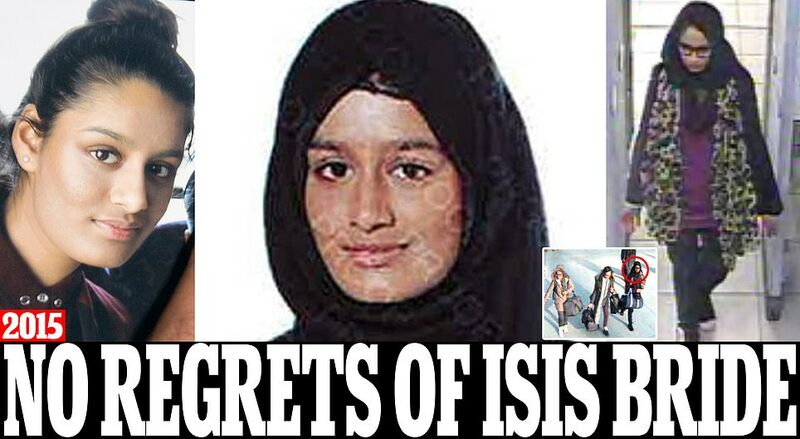 Shamima Begum (main picture in her passport photo) was just 15 (left) when she and two classmates Kadiz Sultana and Amira Abase travelled to Syria in February 2015 (right at Gatwick, and together inset). Today there are calls for Begum to be barred from returning to the UK completely or arrested and prosecuted if she sets foot on British soil. But at the time of her disappearance four years ago Sir Bernard Hogan-Howe, then Commissioner of the Metropolitan Police, said if the girls came back they would be treated as 'victims' who were groomed online and would not be prosecuted. 800 men, women and children from Britain went to Syria and Iraq to join - but 400 returned and only around 40 have been prosecuted for terrorism offences. Security Minister Ben Wallace today confirmed that Begum 'has a right to come home' and will be allowed back into Britain if she presents herself at a British consulate in Iraq or Turkey. He said: 'British citizens have rights whoever they are but if they have gone join IS and return to the UK they can expect to be questioned and, if possible, prosecuted'. He added: 'Actions have consequences. I think the public will be reflecting on why these people want to return to a country they said they hate'.